As previously discussed the Drawing Module does it's job and produces the drawing our users require, but has its limitations. Now having some a little spare time every now and then in the evening, it seemed a nice little job in the mean time to experiment to see if we could improve this. How I envisage the Drawing Module to work is similar to what I've experienced in the past but relatively similar to its current behaviour. This is just an idea of the workflow I had in mind for using the Drawing Module. 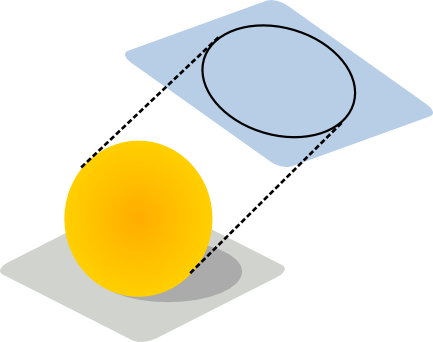 Orthographic Projections can be created by dragging a projection in direction. Currently the template would be kept as SVG so that this can be edited. I still don't know if these could be generalised so that it can be exported to another format but I don't think it would make much sense. However ideally it should be very easy to manipulate any 'placeholders' . This is not an immediate issue but I would speculate that the template placeholders would have a special edit mode to prevent any accidental changes by the user. Below are the first jobs that need achieving for experimenting with a few ideas. By unifying and abstracting the resultant shapes that are projected by Brep_HLR there is no restriction how these can be later represented. This means if the projected shape is a circle, we store the center point coordinates and its radius. This is extended to points, ellipses, b-spline form. These can later be converted very easily into any other format whether .SVG, .DXF, Html Canvas or perhaps even Librecad may produce their own representation - who knows? It also allows us to represent this graphically in any way we want. Every time our part feature changes, this geometry is recalculated and can be then used in the user interface as needed. Looking more deeper into the projection code. Their algorithm seems to work by projecting all the edges and faces onto a projection plane, quite similar to an OpenGL projector. Then the algorithm sorts through all the edges and compares these with each project face to check if they are hidden. Each edge and face is mapped from the original TopoDS_Shape and an index is built. By extracting these we can build up better integration so the drawing can have more interaction. I.e. we can extract edge lengths or update the projection without losing our annotations. This could be done in SVG or using any other method. I prefer the use of QGraphicsView simply because it provides a framework for building up interactivity at a lower level which I don't think can be achieved in a web interface and should hopefully improve performance too. It would have been interesting to have used QML or QtQuick, but there are no objects available for drawing arbitrary shapes till Qt 5 and is more appropriate for dynamic interfaces. Obviously there is more stuff that definitely needs considering, but this is at the moment an experiment to see what is feasible. In summary, what I am attempted is building a lower level data structure for storing geometry and reference data that can be exported and manipulated easily in any format. Then integrating this into QGraphicsView. Overtime I will report on my progress for what I have currently achieved in my spare time. - Indeed I think there is not much sense to try to think in unified templates for different export formats. SVG is very different from DXF, etc. Ideally I believe in some future we might be able to create, inside the Drawing module, different kinds of pages, svg or dxf, each with its own template. But maybe it is even easier to simply convert the svg one to dxf, I don't know. - I didn't know the OCC projection algorithm was able to maintain a relationship between the original edges and the projected ones! This is super interesting, it would allow us to "tag" the edges in the SVG representation... Many possibilities arise there. Hi Yorik, thank you for the comments! I am not really sure on the page template format - From my own experience, every time I have created a technical document I print it straight away or transfer to .pdf but having a backend flexible so that we can accommodate whichever format would be nice. The OCC algorithm hides alot of its functionality in its private methods and these you cannot even inherit from. It took some time to find this out. It does in fact project both edges and faces - you can get a list of faces too, but I don't think these are exposed in the sorting algorithm (HLRBRep_HLRToShape) so possibly we might be able to get filled shapes. I think having colored 3D views is quite important especially in your role. But it would be useful for technical documentation and illustration which is actually lacking the Mechanical CAD package I use. It would be interesting to look at ArchVRM.py - especially for the clipping / section views. I am still terrible at python but it might be a good exercise to convert it to c++ for you :) I will have a look at seeing if OCC can extract filled shapes when I am free.